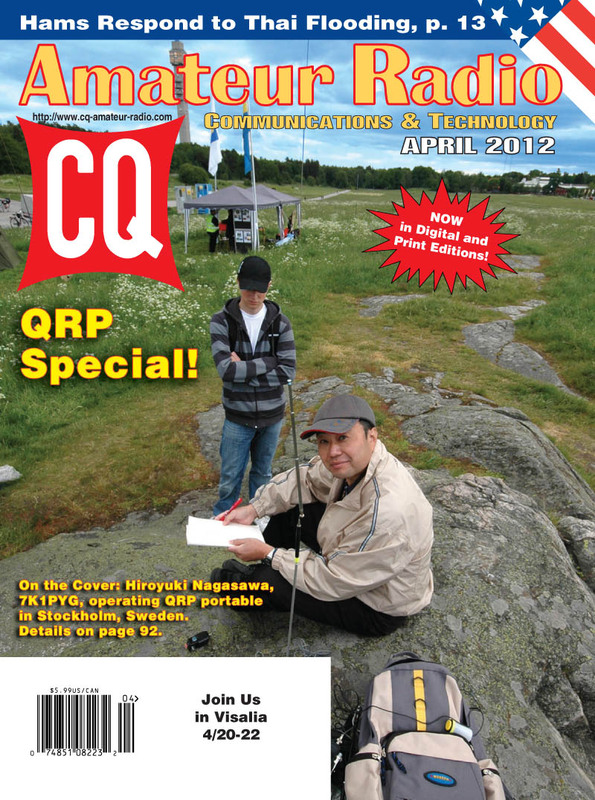 The April issue of CQ features our first QRP Special in about ten years. But first, we have a report from Thailand about how hams there helped respond to the country's worst flooding in half a century. Charly Harpole, HS0ZCW/K4VUD, provides the narrative, while Champ Muangamphun, E21EIC, tells the story in photos. Our QRP Special begins with Woody Hester, WD9F, describing his adventures in operating low-power from Hawaii, in "QRP in Paradise." Bill Minikiewicz, W4FSV, follows with a story about a club construction project, "The 'Splinter' QRPp Trans-Receiver." Next, Scott Rought, KA8SMA, describes his "QRP Superstation" and says you can have one, too! 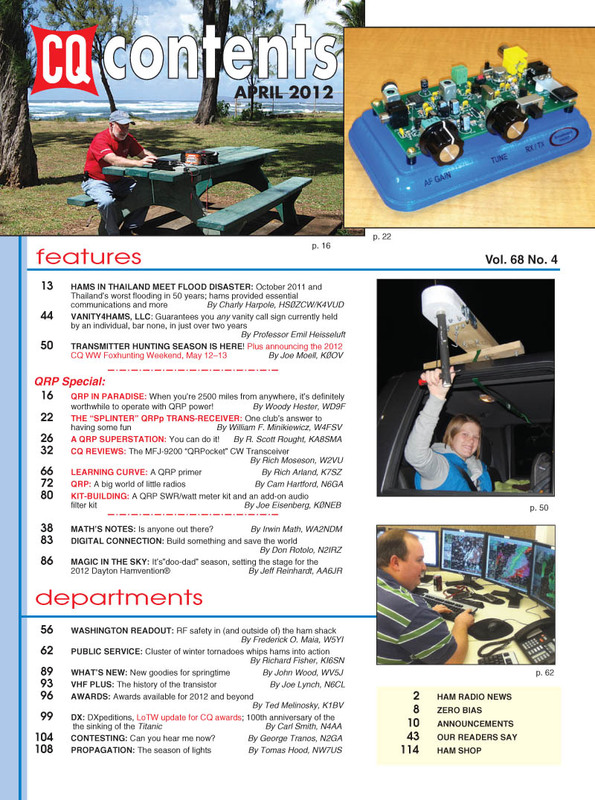 Editor Rich Moseson, W2VU, reviews the MFJ-9200 "QRPocket" CW transceiver, and in our columns, "Learning Curve" editor Rich Arland, K7SZ, offers a QRP Primer while QRP Editor Cam Hartford, N6GA, describes "A Big World of Little Radios" and Kit-Building Editor Joe Eisenberg, K0NEB, looks at a QRP SWR/Wattmeter kit and an add-on audio filter kit for QRP rigs. Moving beyond the world of low-power operating, we have our annual April visit from Professor Emil Heisseluft, who this year looks down the barrel of a group of New Jersey entrepreneurs who (for a price) will arrange for anyone to get any vanity call sign, even if someone else already has it! CQ World Wide Foxhunting Weekend Coordinator Joe Moell, K0OV, says "Transmitter Hunting Season is Here" and provides tips for foxhunting success along with the announcement of the 2012 CQ World Wide Foxhunting Weekend on May 12-13. Among our non-QRP columns this month, "Math's Notes" editor Irwin Math, WA2NDM, asks "Is Anyone Out There? "; Washington Editor Fred Maia, W5YI, looks at RF safety issues both inside and outside of the ham shack; and Public Service Editor Richard Fisher, KI6SN, reports on ham radio's response to a cluster of winter tornadoes in Arkansas. 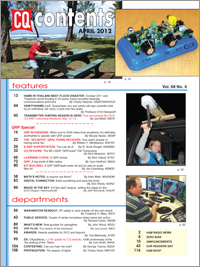 Digital Editor Don Rotolo, N2IRZ, says "Build Something and Save the World," while "Magic in the Sky" columnist Jeff Reinhardt, AA6JR, discusses "Doo-Dad Season" and previews the 2012 Dayton Hamvention® (with tongue planted firmly in cheek … it is April, after all). New Products Editor John Wood, WV5J, looks at "New Goodies for Springtime," Awards Editor Ted Melinosky, K1BV, previews some short-term awards for this year only, "VHF-Plus" editor Joe Lynch, N6CL, looks back at the early days of the transistor as well as new research that may one day replace current semiconductor materials with … sugar! DX Editor Carl Smith, N4AA, provides updates on DXpeditions, the new deal permitting the ARRL's Logbook of the World program to begin being used for CQ awards, and the centennial of the sinking of the Titanic. Contesting Editor George Tranos, N2GA, asks, "Can You Hear Me Now?" and Propagation Editor Tomas Hood, NW7US, reports on the phenomenon of aurora in "The Season of Lights." That's a brief look at what's coming up in the April issue of CQ magazine, which should be on newsstands and in subscribers' mailboxes the beginning of April, and available to digital edition subscribers by April 1. 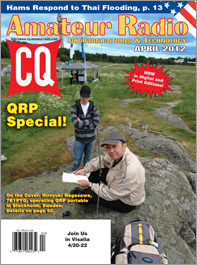 For information on becoming a CQ subscriber - Click Here!